Last update (May 05, 2009): Download the latest Firmware Update (Version 1.19). This page is a collection of Ricoh CX1 digital point and shoot camera tips, tricks, techniques, camera settings and hacks by users and owners that I’ve across in forums, online communities, blogs and related websites. Instructions and file downloads for Windows and Macintosh platforms can be accessed here. The DR mode really seems to make a difference when a photo has a lot of darker areas because it pulls in the extra detail from those areas. It also seems to make the colors a bit more constrasty. I think I’ll use te DR mode most when I am photographing a scene with heavy backlighting. The images in question are titled “Image with no DR, ISO 80” and “Same Image With DR, ISO 80“, and can be downloaded at Richard Kloc’s CX1 gallery (or right-click the image titles to download them to your hard drive for evaluation). I did notice that the version with DR switched on has richer tonality and colors. w4rmk recommends setting the Image parameter on “Hard”. This boosts sharpness and contrast. Removing the CA (chromatic aberration) in Ricoh CX1 photos is a cinch if you have Adobe Photoshop Lightroom installed on your computer — read this short post on how. 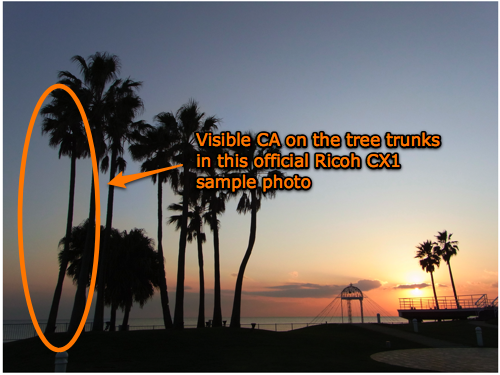 For an example of a photo with mild levels of CA, view the tree trunks on the left in this official CX1 landscape sample image at Ricoh.com (opens in a new browser window, or right-click to save to your hard drive).